Florence Scovel Shinn (1871-1940) was a New Thought teacher and was an exciting and fascinating woman who lived her life according to her own rules. For example, she divorced her husband, Everett Shinn, in 1912. Today, divorce is commonplace but back in her day, it definitely was not. Many years ago I spoke with a woman who was divorced in the 1920s and she told me that the “decent” women in town would cross the street rather than pass by her on the sidewalk. The stigma was obviously severe on women (we can presume it was less scandalous for men), yet Mrs. Shinn chose to pursue her freedom regardless of the cost. 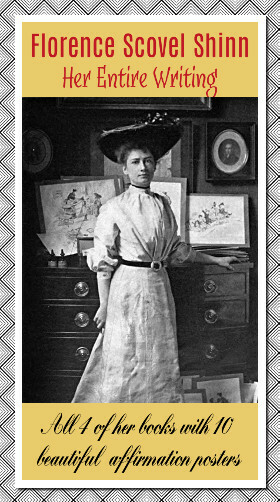 Although she is best remembered for her writings, she was also an illustrator. Shortly after her divorce she began her love affair with New Thought teachings and her first book was The Game of Life and How To Play It. Here is why Florence Shinn is so helpful for us modern readers: her work is intensely PRACTICAL! She wasn’t interested in philosophy, but in ways we can change our lives. Read her works for yourself and decide if you think she has succeeded. About two years ago, I was working on an elaborate project that just would not come together! Every step forward created new obstacles and I was so disgusted I was ready to dump the entire mess. In frustration I decided to read a few pages of one of Florence Shinn’s books. She describes talking with a client and telling him that the ‘doors of opportunity’ were open. She could tell he wasn’t very impressed so she added that the doors were ‘nailed open’. As soon as I read those words, I saw a vivid image in my mind. There was a wall that was so tall that it was impossible to scale but there was a door in this wall and it was nailed open. The odd thing about this image is that it looked like a cartoon in a magazine. It was in black and white, with very few lines, and the nails were large and scattered around. But … through this door was a breathtaking scene. It looked like a spectacular garden with incredibly vivid colors that were glowing and gleaming. I could also hear the sound of wind chimes and running water. The scene was magnificent and compelling. I interpreted this as a metaphor for my project and was able to go back to it with enthusiasm. I finished it quickly and the obstacles that had formerly appeared so formidable just melted away. It was truly amazing, but just an example of the assistance you can discover in Florence Shinn’s works which we have in our BlissPlan shop. She wrote four books and we have an inexpensive edition of all four of her books and you can download them in moments.